Direct Auto of Tennessee is excited to offer this 2014 Hyundai Equus. This 2014 Hyundai Equus comes with a CARFAX Buyback Guarantee, which means you can buy with certainty. Is it possible to fall in love with a vehicle? It is when your vehicle is as prestige as the Hyundai Equus. 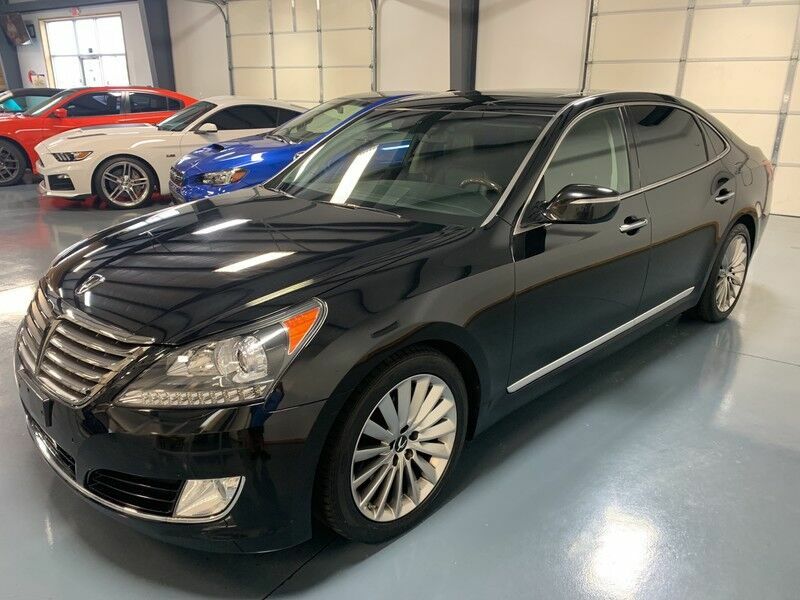 Marked by excellent quality and features with unmistakable refined leather interior that added value and class to the Hyundai Equus If you are looking for a pre-owned vehicle that looks brand-new, look no further than this Black Noir Pearl Hyundai Equus. Why go with a basic vehicle when you can have it all in this well-optioned Hyundai Equus? Left your phone at the restaurant? No problem. With the navigation system on this Hyundai Equus, you'll be able to quickly find your way back to get it. The paint on this car has no serious defects, blemishes, scratches or scrapes. More information about the 2014 Hyundai Equus: The Equus is Hyundai's luxury flagship, aimed directly at top models from other luxury brands -- including the Lexus LS and Jaguar XJ -- but costing thousands less. The V8 in the Equus, at 429 horsepower, is Hyundai's most powerful engine ever -- and more powerful than the engines in the Lexus LS 460 and Mercedes-Benz S550. The 8-speed automatic transmission enhances the Equus' performance while still managing to return an EPA-estimated 24 mpg highway. There are yet other reasons why the Equus stands out from the luxury pack, and they're not all value-related. According to Hyundai, the Equus has more leg, head, and shoulder room, both in front and in back, than the Lexus LS 460. It's also a standout for safety features, and an IIHS Top Safety Pick. This model sets itself apart with comfortable ride, lavish trims and details, Spacious interior, Equus Ultimate offers prestige luxury for tens of thousands less than others in its class, strong safety record, and strong V8 performance While we try to make sure that all prices posted here are accurate at all times, we cannot be responsible for typographical and other errors that may appear on the site. If the posted price for a vehicle or service is incorrect due to typographical or other error (e.g., data transmission), this dealership or [website provider] is only responsible for the correct price, which we will endeavor to provide to you as soon as we become aware of the error. We make every effort to provide you the most accurate, up-to-the-minute information, however it is your responsibility to verify with the Dealer that all details listed are accurate. Vehicle images and descriptions posted on our website pages are the representations provided by our suppliers. Please note that actual vehicle may differ slightly from specifications and/or the pictures. The dealership is not responsible for typographical, pricing, product information, advertising or shipping errors. Advertised prices and available quantities are subject to change without notice. In the event a vehicle is listed at an incorrect price due to typographical, photographic, or technical error or error in pricing information received from our suppliers, the dealership shall have the right to refuse or cancel any orders placed for vehicle listed at the incorrect price. Prices shown do not include state, city, and county tax, license, registration or tag fees and the cost of optional equipment selected by the purchaser. A $250.00 dealer documentation fee will also be added. Out of state buyers are responsible for all state, county, city taxes and fees, as well as title, licensing and registration fees in the state that the vehicle will be registered. All prices and offers include all incentives which the dealer retains unless otherwise specifically provided. Dealer not responsible for errors and omissions; all offers subject to change without notice, please confirm listings with dealer.